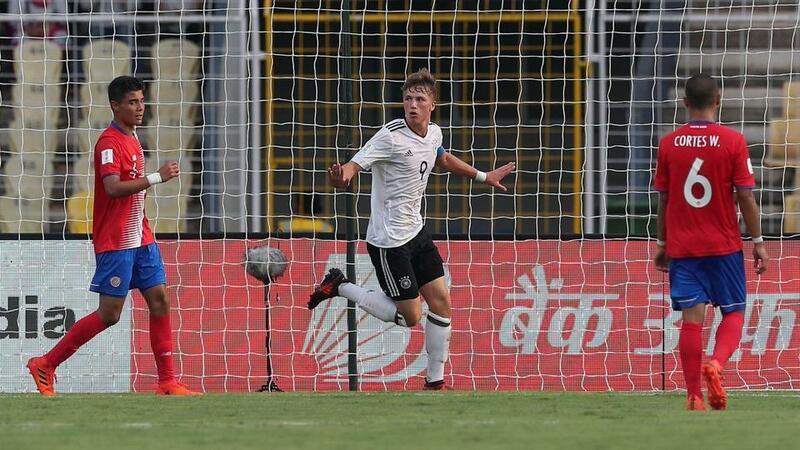 Jann-Fiete Arp starred in Germany’s 2-1 win over Costa Rica in their opening FIFA U-17 World Cup game. The goal-scoring run of Germany U-17 striker Jann-Fiete Arp has created a lot of buzz in his homeland. Many are backing the Hamburg frontman to lead Die Mannschaft’s frontline in the future. The main reason for that is Germany’s lack of striking options. While they have produced a plethora of quality attacking midfielders, there has been a dearth of out-and-out strikers. The current national squad banks on Mario Gomez, who at 32 isn’t getting any younger, and Timo Werner, who has started his Germany career well, winning the golden boot at the Confederations Cup. However, doubts remain over his durability. So all eyes are on Arp, his development in the next couple of years and whether he can convert his potential into something substantial. Germany U-17 coach Christian Wuck said after their 2-1 win over Costa Rica on Saturday that some of these youngsters will be knocking on the national team door in three to four years, with Arp being one of the foremost. One of the hottest properties in German football, the 17-year-old arrived at the U-17 FIFA World Cup with a big reputation and he didn’t disappoint, scoring one and assisting the other in their 2-1 win against Costa Rica. Arp, who was the top-scorer at the U-17 European Championships, could have scored a hat-trick but he wasn’t lucky enough. He scored two hat-tricks at the Euros, including one in just 13 minutes against Bosnia and Herzegovina in the group stage. He scored many goals for Hamburg U-17 last season which earned him the Fritz Walter Medal, which is awarded to the best players in different age groups. While Arp is an out-an-out striker, he doesn’t hang between defenders to get services. He likes to link up with the midfielders, plays wide on occasions and most importantly has a killer instinct with the ball at his feet. His exploits haven’t gone unnoticed with Chelsea even inquiring about his availability but Arp decided to stick with Hamburg after he was offered a new contract till 2019 and coach Markus Gisdol included him in the main squad. Two weeks ago he came on as a substitute in Hamburg’s game against Werder Bremen, becoming the first player born this millennium to play in the Bundesliga. Top German clubs like Bayern Munich and Borussia Dortmund are also keeping a close eye on his development. Coach Gisdol calls him a ‘special talent’ and also spoke about giving him more opportunities as the season progresses. Under-17 coach Wuck calls him a ‘born leader’ and ‘more matured’ than other players his age. Getting opportunities in the Bundesliga won’t be a problem for Arp as it’s the only league amongst te top-five European leagues that has seen a rise in the number of local players over the last few years.